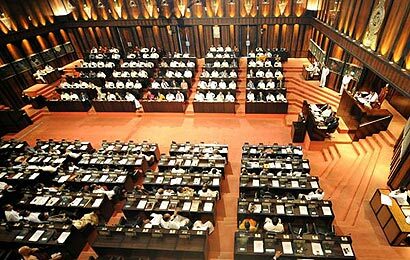 The debate on the motion, submitted by nine MPs from the government, asking that the Office of the High Commissioner of Human Rights (OHCHR) not conduct an investigation into human rights allegations in the country, is expected to be a heated debate government and opposition MPs said yesterday. The motion will be taken up for debate in Parliament today (17). One of the nine MPs who had signed the motion is set to present it in Parliament. Malini Fonseka, Janaka Bandara, Uditha Lokubandara, J.R.P. Suriyapperuma, Sunil Wijesinghe and R. Duminda Silva have submitted the motion. The debate is to start at 2.00 p.m. on 17 and will continue until 6.30 p.m. It will then continue on to 18 June, and will start at 2.00 p.m. and end at 6.00 p.m., thereafter a vote will be taken on the motion.